A narrow, upright oval tree that tends to have a straight central leader. 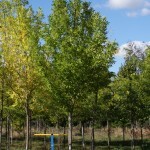 Mid-green foliage turns bright yellow in the fall. A male selection. It is tolerant of high pH, drought, wind, urban conditions and heavy wet soils. Introduced in 1957 by Summit Nursery of Minnesota.